Bible Society exists to offer the Bible to the world. Here at home in England and Wales, children have fewer opportunities to encounter the Bible, many growing up without the most basic understanding of Bible stories. Bible Society would like to give all children the opportunity to engage with Bible stories, in ways that are appropriate to their situation. This project enables primary school children in multi-faith primary schools to hear the Bible stories in a fun, engaging, relevant and educational way. 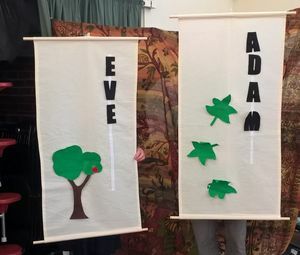 Different Christian church denominations come together to deliver Bible stories as part of collective worship in primary schools. During delivery, we use banners so that we do not physically portray a prophet, which would be highly offensive for some other faiths in the primary school. For many of the children, Open the Book is the first and only opportunity they get to engage with the stories of the Bible. It helps children to have a better understanding of the Christian faith which has influenced our British heritage, and ultimately to work and contribute to multi-cultural Britain. Open the Book started 19 years ago and currently has over 16,000 volunteers sharing Bible stories in over 3,000 primary schools. However, the majority of these are in rural areas or Church schools. We recognised the importance of making the material accessible to all faiths, and that we needed to do that respectfully without diluting the Christian nature of our programme. This multi-faith project has afforded the opportunity for learning as well as the development of materials, which will enable us to roll out Open the Book in more urban areas and multi-faith environments with confidence. We have worked closely with our partners, Birmingham City Mission, on the Bible storytelling in a multi-faith context materials and to develop a training programme, which helps volunteers to understand the context of working in multi-faith primary schools. Bible Society would be grateful for your prayers as we roll this programme out into more cities and schools. We now have more schools wanting teams to deliver acts of collective worship/assemblies. Please pray that more churches will come forward to help and for our current active teams as they use the Bible storytelling in a multi-faith context materials. Our hope is that bridges will continue to be built between different faiths and cultures within communities. This will happen as different denominations from the Christian church come together to support the sharing of Bible stories in multi-faith primary schools. It will also give children a foundational understanding of our society’s Christian heritage and culture. For more information about this project please click here to access the Bible Society website.